Newbury, 1997. Sal is attempting to cook dinner for the family. She and husband David have pulled off a coup and gathered their brood back home for the weekend. Eldest son Carl is bringing his new girlfriend to meet everyone for the first time; middle daughter Polly is back from Cambridge University for the occasion; and youngest Tom will hopefully make it out of detention in time for dinner. 27 June - 10 August 2019. 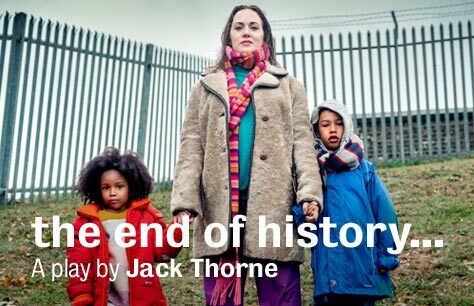 Please note on 17 July there will be a post-show talk: Writer Jack Thorne in conversation with Royal Court Young Agitators. This event will be free to patrons with a ticket for that evening's performance. There will be Captioned performances Wed 10, 17 , 24, 31 Jul & 7 Aug 7.30pm , an Audio Described performance Sat 3 Aug 2.30pm with touch tour at 1pm, and a Relaxed Environment performance Sat 27 Jul 2.30pm.